The Hawkshead Relish Company has launched their latest innovation in a flavour extravagance with the NEW Black Garlic Ketchup. The flavour of black garlic is created with baking whole, fresh garlic bulbs for 40 days at a very low temperature creating an extraordinary flavour; rich, smooth & bursting with a balsamic sweetness. Combining the pureed garlic cloves by hand with fresh tomatoes, olive oil & Anglesey Sea Salt this ketchup sauce is the ultimate edition to cooked meats, tartlets, potato wedges, roast veg, shell fish, stews & glazes; the list goes on & on! 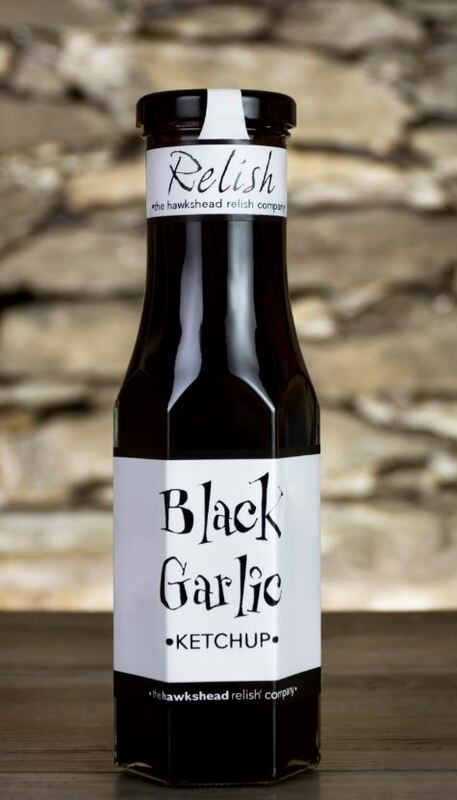 Maria Whitehead, co-owner of Hawkshead Relish, “The flavour of black garlic is exquisite & relatively new to the British palate, although seen on some adventurous menus, we wanted to bring this tremendous innovation to the public in a way that it can be easily appreciated & enjoyed! We’ve made it in a way that the unadventurous will just love as a dynamic dip for chips, to those who will delight in its versatility in adding luscious flavour in cooking & preparation”. The credentials of this nouveau condiment will see it become an essential classic. Handmade with optimum quality ingredients & completely natural without any artificial flavouring, colouring or additives, free from gluten & nuts as well as suitable for vegetarians.